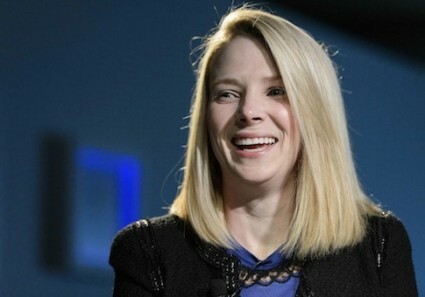 CEO Marissa Mayer has taken some provocative measures to spark advertising revenue since joining Yahoo in July 2012. Bloomberg reported the tech queen is being paid handsomely for her efforts to turn around the company, taking in $36.6 million for her first six months on the job. Yahoo recently announced six new digital series for its fall lineup including the comedy "Losing Your Virginity with John Stamos." The digital series will feature candid interviews between host John Stamos and celebrities spilling their dirty little secrets. "We're going to do re-enactments (of celebrity first sexual experiences) with puppets, Barbies, animation," Stamos, the one-time star of Full House and ER, told the Hollywood Reporter. The announcement was made on Monday during the Interactive Advertising Bureau’s Digital NewFronts annual conference in New York City. The five-day event provides a platform for the industry’s top media companies to size up their competition through presentations unveiling new original series, partnerships, content offerings, and opportunities. Yahoo’s presentation included a performance by the band the Lumineers. The new media projects reflect an ongoing string of changes Mayer has implemented since taking over including free food, free iPhones, extended maternity leave, and an unpopular ban on telecommuting. Mayer also stirred controversy last year when Yahoo, along with 18 other major U.S. employers, sent a letter to Congress urging it to extend the Production Tax Credit that would ultimately save them thousands of dollars on utility expenditures. Congress extended in January the Production Tax Credit that provides a 2.2 cents tax break per kilowatt-hour of energy produced by wind. The former Google Exec has been one of President Obama’s most successful bundlers, raising nearly $400,000 since 2007. She also played host to a high-profile fundraiser at her Palo Alto home in 2010.